Established in 1967, the BoSox Club is recognized by the Red Sox as the their official booster club supporting Boston baseball.The BoSox Club was originally formed to assist the Red Sox in ticket sales and team promotion, and over the years has grown to become the dynamic organization it is today. Traditionally, the BoSox Club has raised funds both inside and outside its membership to support many worthy causes including the Red Sox Foundation, the Jimmy Fund and New England amateur baseball organizations. The Club also sponsors underserved boys and girls to attend baseball and softball camps each summer In association with the Red Sox Foundation. Through the generous support of an anonymous member, we also honor two to three members of the military at every luncheon and has had a Run to Home Base team since its inception. 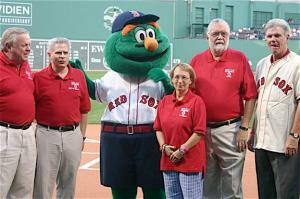 The Club also recognizes a special individual each year with the BoSox Club Man of the Year Award.